T-shirts don’t have an easy life. Food, drinks, stains, and even dirt can cause the best-looking t-shirt to have a permanent nasty and unsightly stain. While a stained shirt is still 100% fine to wear and use, just going outside in public can give even the bravest of people jitters about what other people will think when they see that unsightly stain. One of the worst stains to get on a t-shirt is oil, which comes in many forms besides motor oil. When most people get oil stains on their t-shirts, they immediately think that there’s no way it’s coming out and the best thing to do is throw it in the trashcan or save it as a “grubby” t-shirt for when they’re doing house or yard work. The reality of oil stains on t-shirts is that they can be removed – you just have to know how to do it properly. Being that we’re a t-shirt company, that makes us the foremost experts on t-shirts and shirts in general (we have many different types of shirts for sale). We’re writing this blog post to share with you our super-secret patented trick on how to remove oil stains from a shirt. The below method is first in our book of tricks to remove stains from t-shirts. Unlike that ketchup stain you got on your white t-shirt at the BBQ this past weekend, you’re in a race against time when it comes to oil stains…and time is not on your side. As the oil stain “sets” into the fabric of the shirt, it bonds on a molecular level as the cotton absorbs the oil. The more time that goes by, the longer the stain has had time to make itself at home. Like all unwanted house guests, the longer oil remains on a t-shirt, the harder it is to remove. So, think and act fast. You’re first going to want to blot the stain with a clean towel (that you don’t mind getting dirty). This will help remove any excess grease that’s just waiting to find a nice comfy home on your t-shirt. If you’re in a pinch, a paper towel can take the place of a regular cotton towel. Press the stain on both sides to soak up any excess oil. Gently blot, blot, blot, and as the seconds turn into minutes, you should have been able to pick up all the excess oil and transfer it to the rag or cloth you’re using to blot. Before you throw the shirt in the washing machine or move onto the next step, locate the shirt tag and read the washing instructions. Some shirts will need to be washed in hot water, others cold. Be careful if you’re using any 3rd party stain remover sprays (commonly bought at Walmart or the supermarket). 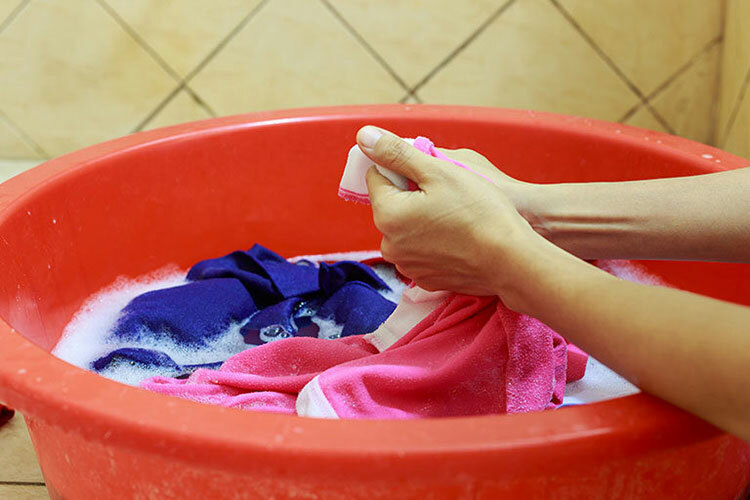 They might advise you to “wash in as warm water as possible.” Washing a shirt in warm water could cause premature wear and tear and even shrinkage. To use warm water or not to use warm water. That is the question you’ll have to determine the answer to. Are you comfortable with the fact that washing a shirt in hot water might cause it to shrink a little bit? If so, turn up that temperature dial to “HOT” and scrub away. This is probably the most important step to removing oil from a t-shirt. You’ll need to pick your weapon for the upcoming fight against the oil stain. Liquid detergent for washing clothes. Choose your weapon carefully. Some products could potentially stain the t-shirt, so it’s best to test it in an inconspicuous area such as the bottom inside of the shirt. Once you’re confident that the stain treatment won’t damage or stain the shirt further, follow the instructions on the bottle. If you’re using the old school method of Dawn dishwashing soap, pre-treat it for a few minutes before throwing it into the washing machine. There are many different brands of laundry soap that are formulated to help remove oil stains. We’re not going to make any recommendations other than you should only buy a name-brand detergent that’s sold by a big-name retail store. It’s all the same. Did we mention that the most critical step in removing an oil stain was the pre-treatment? Well, we lied. The most vital step is to visually inspect the t-shirt after it’s been run through the washing machine. Can you see any indications of the stain still existing? If so, rewash it WITHOUT drying. Once you dry the shirt, the head of the dryer will cause any remnants of the stain to set in permanently. Therefore, dry at your own risk. Oil is a nasty substance that has an uncanny ability to permanently make itself a home on a t-shirt. The next time you get a shirt stain, try the above method(s) to remove it. There is an excellent chance that if you catch and treat the stain before it has a chance to set, you’ll be able to quickly and completely remove it once you pre-treat and wash it.